It’s Black History Month, and I’ve decided to share some ways our history and our heritage have been instilled in my life — not only in February, but all year long. 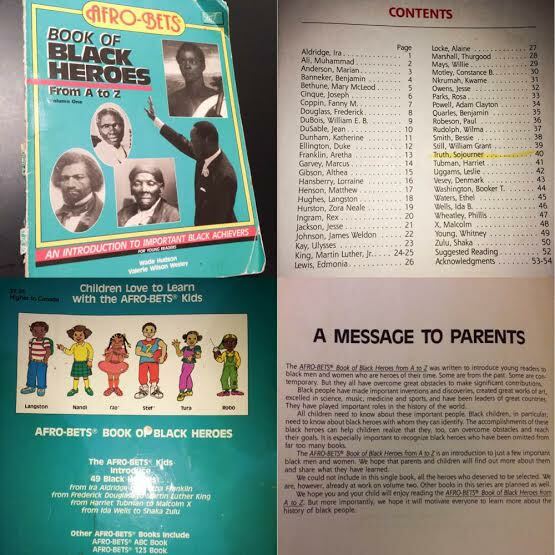 My folks bought me Afro-Bets’ Book of Black Heroes From A to Z by Wade Hudson a long, long, lonnng time ago when I was a little girl. I have been in love with this book since my first time reading it. The life of a black leader is highlighted for each letter of the alphabet in easy-to-read language suitable for children. A cast of young black kids pop up throughout the book, shaping themselves to spell the last names of each leader. Although this book may be a little dated, it doesn’t take away from the power in arming our children with knowledge about the ones who came before them. Every year of elementary school, I brought this book into my class to share and every year, my teachers asked to borrow it for their lessons. As a little girl, I felt so proud to be able to contribute to what my classmates and I learned…and I felt even more proud to see people in books doing great things that looked like me. Don’t leave the babies out of black history. Introduce them to books and introduce them to love.